Dams may be natural or man made and obstructions that stop the forward and downward movement of streams. Even straight channels show some degree of wandering of the deepest channel. This is often due to differences in the bedding material of carried in debris. These are usually formed early in the stream building process and eventually progress to meandering. 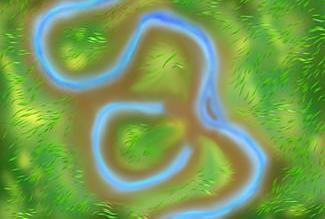 The better developed the meandering is, the older the river must be. The water in a meandering stream does not flow at the same rate throughout its course. Water in the straight sections connecting the curves, tends to be fast near the center channel and more equal along the edges. Water running through a curved section runs fastest at the outside of the curve. Maximum velocity tends to be below the surface but at the greatest bend. This can lead to undercutting of the channel wall. The slowest water runs at the inside of a curve and between these two points a sand bar may develop. Oxbow Lake: an oxbow lake is an isolated meander from the original stream. #1 shows normal center flow. The highest velocity and greatest cutting power in on the outside of a river/stream curve (#2). The two curves shown in box #3 continue to wear away at the outside of each curve. Eventually they wear through and create a shorter path for the river. As the water now can move at higher velocity down the new channel it will isolate the water in the meander, and it becomes a lake. The braiding is caused by deposited sediment. Braided channels are created in streams that have high run-off, good velocity, and high variability. During major runoffs both large and small materials are carried, then when the run-off dies down, the larger materials are deposited first and create a series of sand bars. The water finds multiple passages between the bars. The braids constantly change and reform as the water runs swiftly then slow again. This is straight ahead flow without side currents. It is made up of parallel follow all moving in one direction. It is only achieved at very slow velocity. 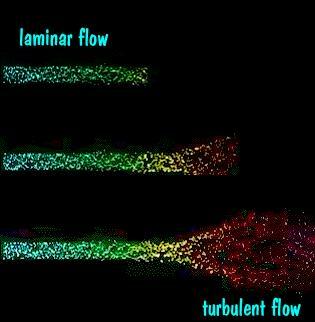 Turbulent is flow with eddies and swirling. 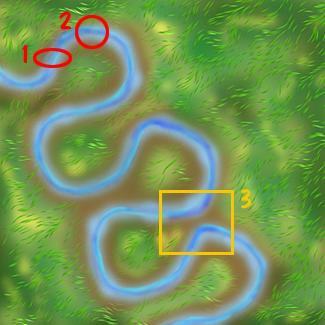 This type of flow may actually create flow patterns that move in the opposite direction to the rest of the stream. This type of flow can raise items from the bottom of the bed and put them temporarily back into the main current. Gravity eventually wins and the particles come to rest again. A suspended load is the fine sediment that is carried within a stream. It is not in solution, but rather hangs in the water by the current. If the current should slow, then some of the particles drop. The dissolved load is a group of ions that are carried as dissolved materials. They do not rely on the speed of the stream to hold them in solution, rather their solubility. Streams which have a major constituent coming from ground water tend to have more of a dissolved load. Coarse grained materials tend to be at the beginning of most streams and it is graded to finer sediment at length. Streams with even slow discharge rates can carry fine sediments and move them downward, but it takes a steep slope to move larger material. Down stream composition is not a constant from stream to stream other than the fact, that finer materials like clay and silt travel further. The mineral composition of a stream is very dependent upon the nature of the rock the stream channel cuts, as well as the tributary streams which supply it with material.